Winner of "Best Islamic Finance Qualification" at the Global Islamic Finance Awards, Ethica is chosen by more professionals and students for Islamic finance certification than any other organization in the world. With over 20,000 paying users in 47 countries, the Dubai-based institute serves banks, universities, and professionals across over 100 organizations. 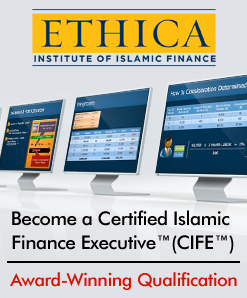 Ethica's 4-month Certified Islamic Finance Executive™ (CIFE™) program is delivered 100% online. The CIFE™ is the only globally recognized certificate accredited by scholars to fully comply with AAOIFI, the world's leading Islamic finance standard. Get a 10% DISCOUNT with Promotional Code SANUSI on Ethica’s Award Winning CIFE™ or Advanced CIFE™ program. Follow the region information below and click on appropriate link. Want to Try The 7 Day Free Islamic Banking & Finance Course before Enrolling? Click Here to sign up for the first 7 lessons of Ethica's highly acclaimed Certified Islamic Finance Executive™ (CIFE™) program - absolutely FREE! “This is not a watered-down version of our curriculum. It is the real thing. In the next 7 Days you will know more Islamic banking than most Islamic bankers in your country. Period.“ Shine in interviews. Bring confidence to your work!